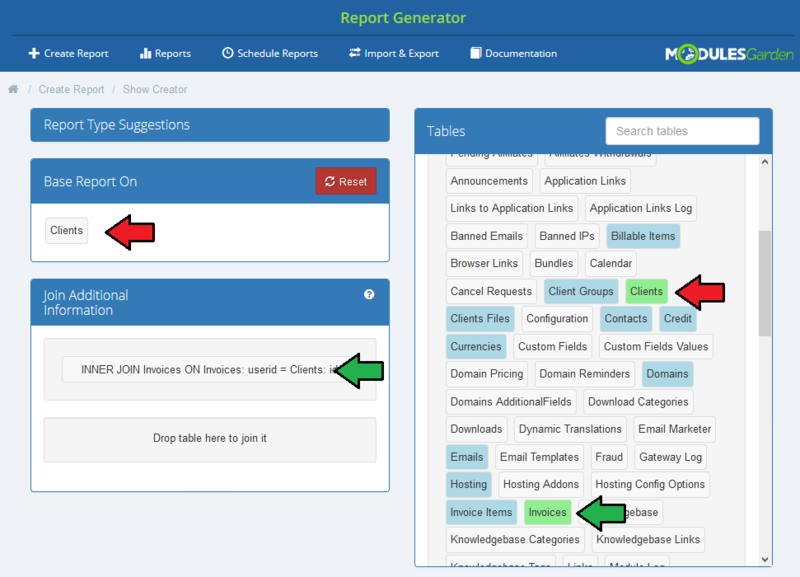 Report Generator For WHMCS allows you to generate and manage any kind of reports using inbuilt creators. 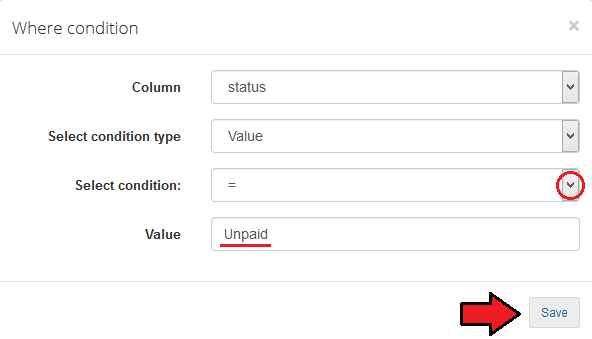 The module lets you adjust reports to your needs through using various filters and even your own PHP code. It also permits to display prepared reports in tables, graphs or charts. You can also schedule the reports creation and send them over an email to specified staff members. 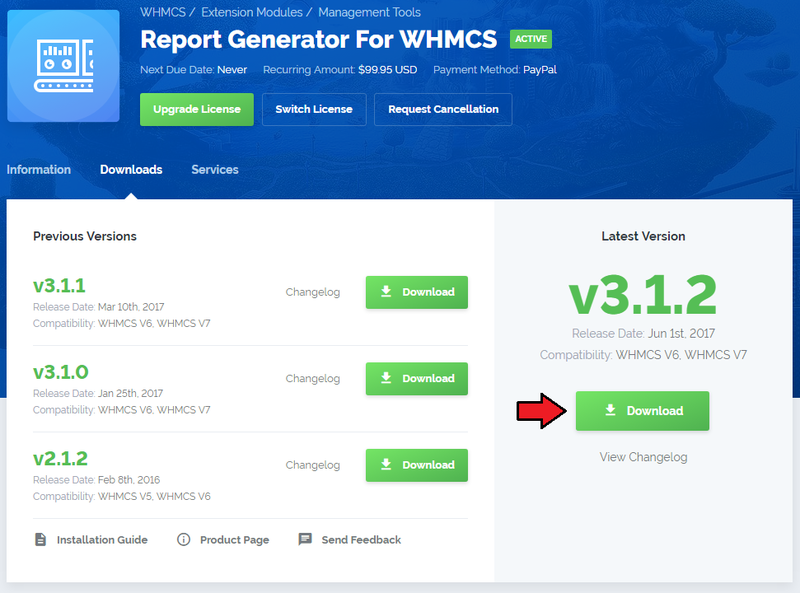 This tutorial will show you how to successfully install and configure Report Generator For WHMCS. 4. 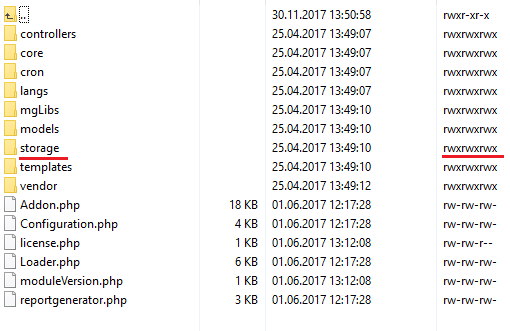 When you install Report Generator For WHMCS for the first time you have to rename 'license_RENAME.php' file. File is located in 'modules/addons/reportgenerator/license_RENAME.php'. Rename it from 'license_RENAME.php' to 'license.php'. 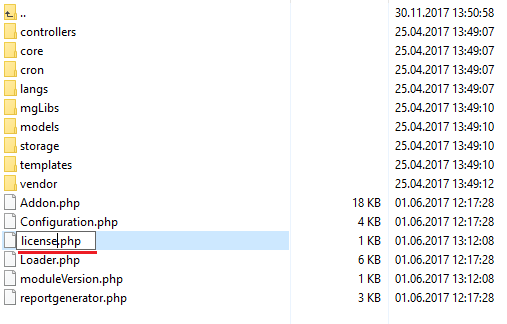 This folder should be available at 'your_whmcs/modules/addons/reportgenerator/' . Log in to your WHMCS admin area. Go to 'Setup' → 'Addon Modules'. Afterwards, find 'Report Generator' and press 'Activate' button. 9. You have just successfully installed Report Generator! 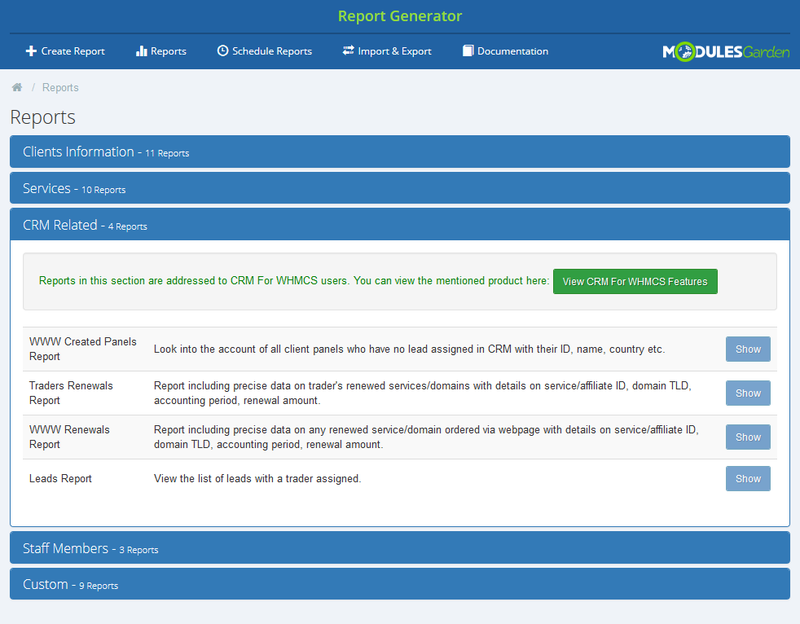 You can access the module at 'Addons' → 'Report Generator'. 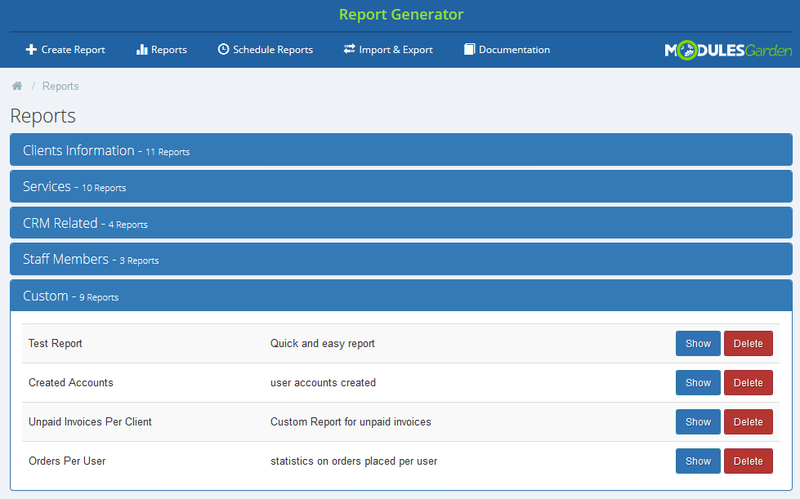 Report Generator For WHMCS allows you to create custom reports using drag & drop WYSIWYG builder. 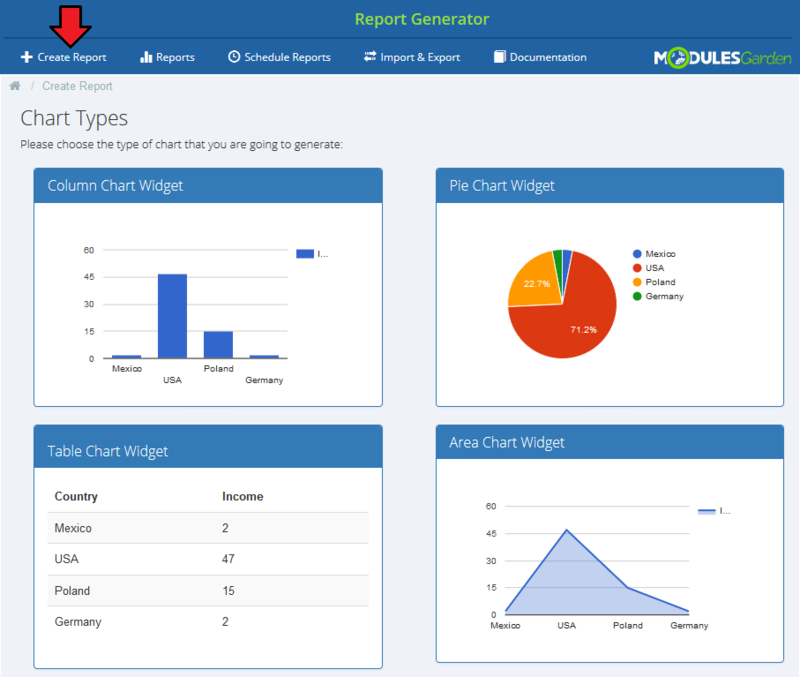 Module also offers additional useful features like predefined reports, import/export of reports, generating reports in PDF and CSV, ability to send them to admins and much more. 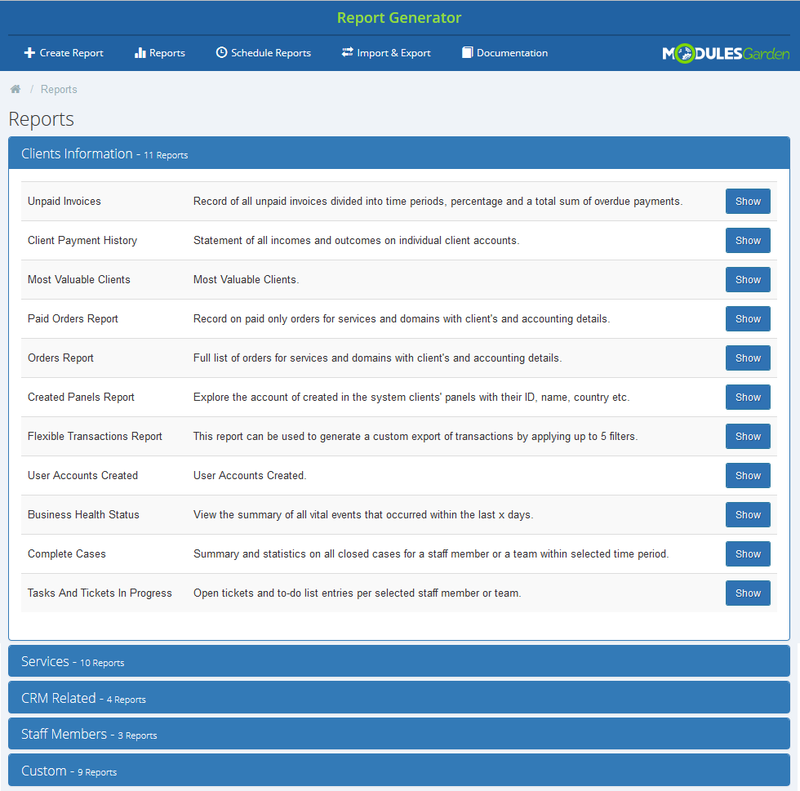 'Reports' the main section of the module, gives a preview of all available reports, those predefined as well as those you create by yourself. 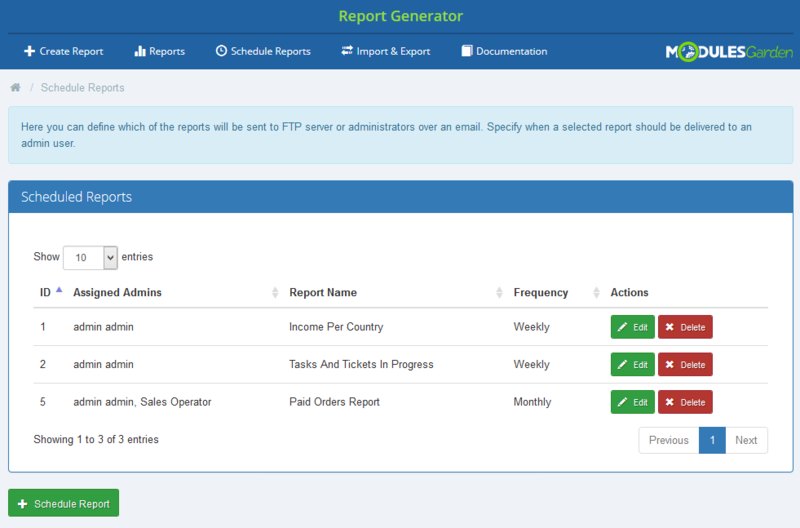 Predefined reports are divided into five categories plus custom reports if you have some. Clients Information - eleven predefined reports that will show statistics on data related to your clients, for example statistics on placed orders, tasks, etc. Services - nine different reports ready to analyze any services related data like income, renewals or transfers in your system. 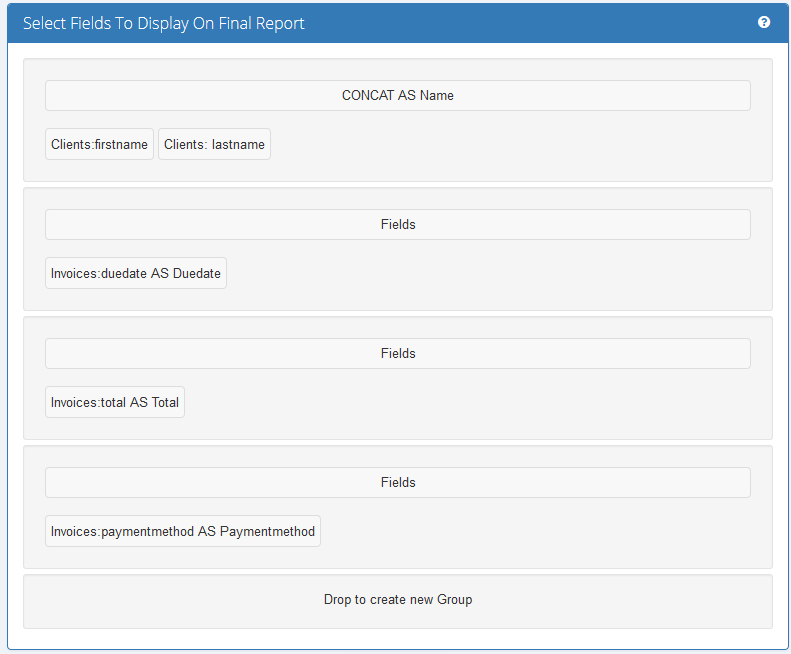 CRM Related - four ground reports based on your CRM data. 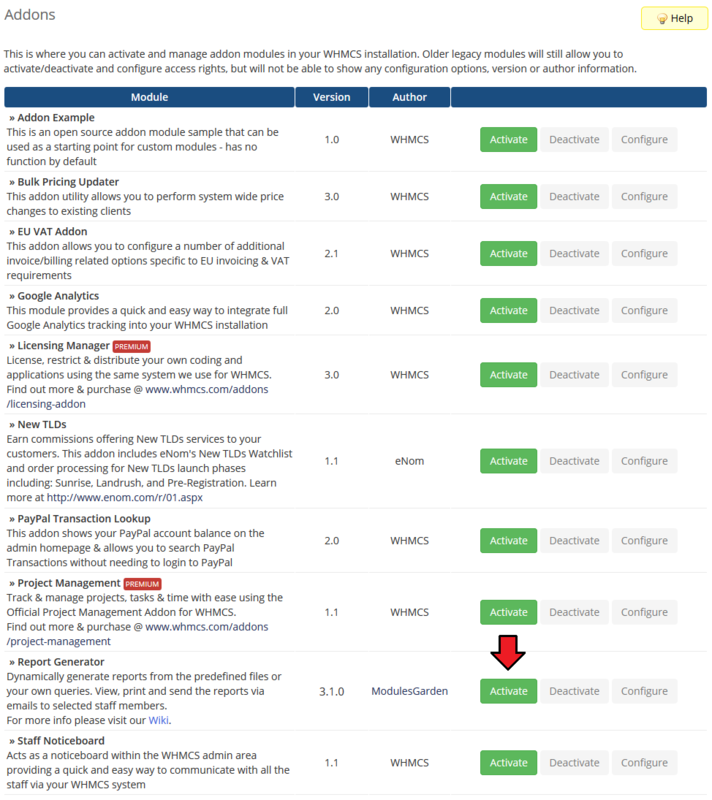 Please note that you can see them only if you are using our CRM For WHMCS module. 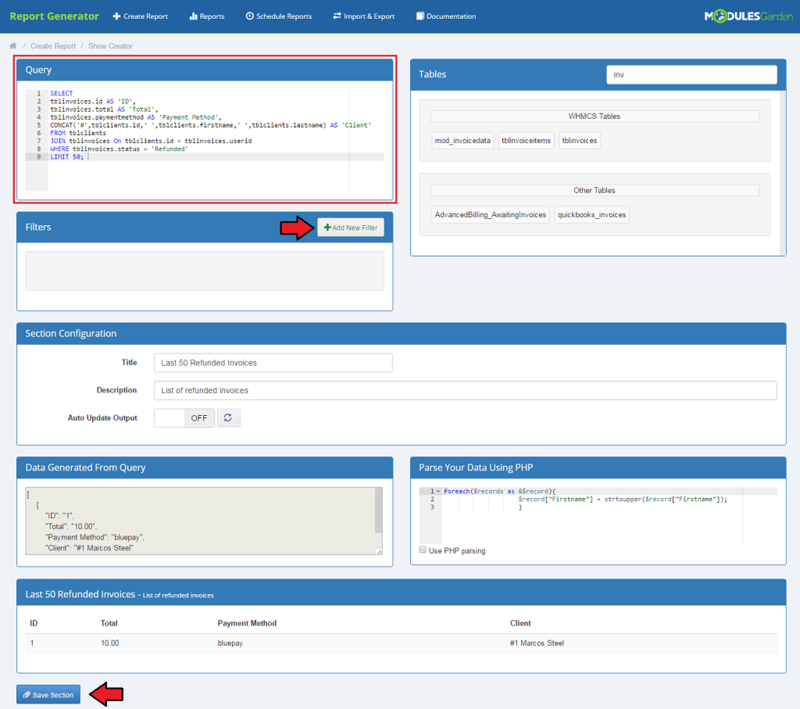 More about CRM For WHMCS can be found here, instructions how to configure your CRM. 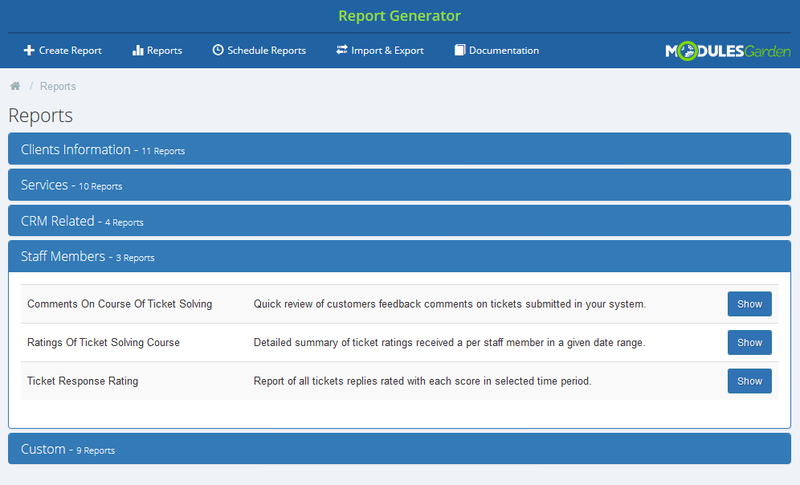 Staff Members - three predefined reports related to staff members and tickets department. 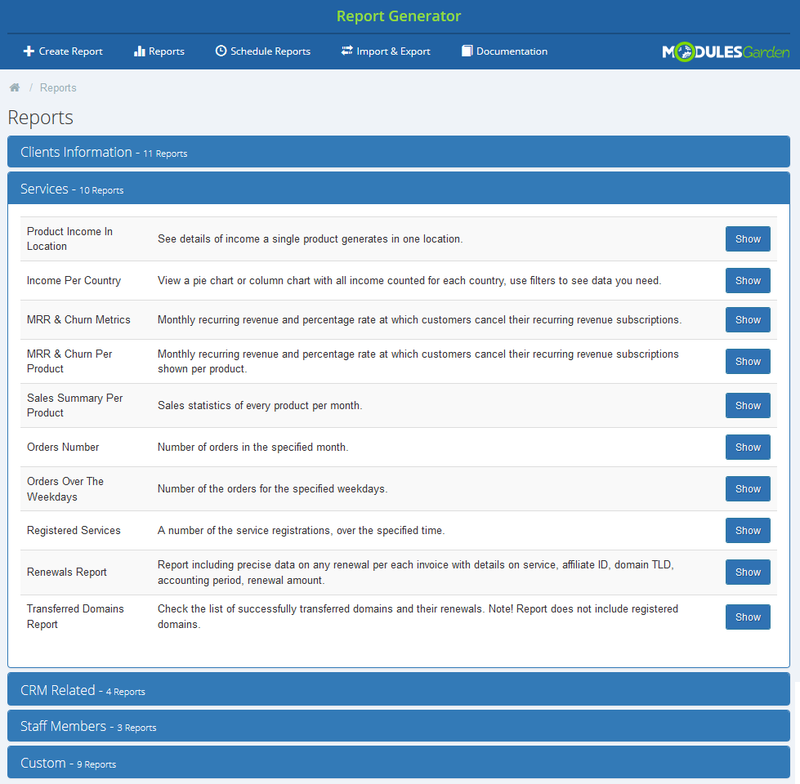 Custom reports - all reports that you have personally created using our inbuilt creators. Press 'Show' button next to a report you are interested in. 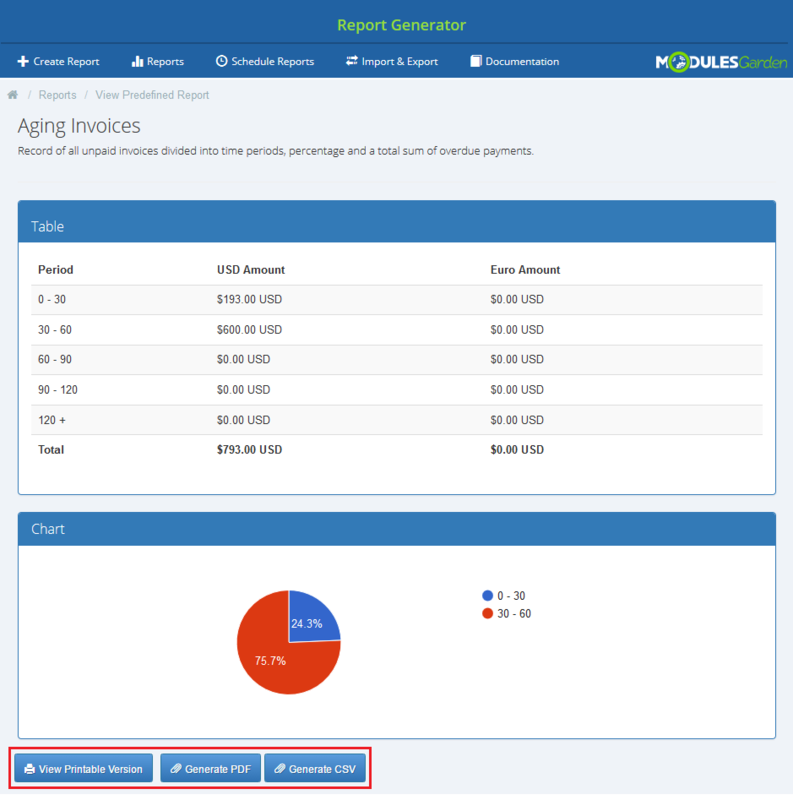 Depending on the type of report you choose, you can set the time frames within which you want to see the statistics. 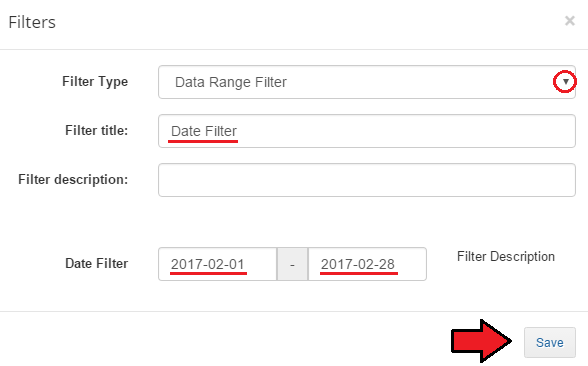 Provide the beginning and ending dates, then press 'Filter' button. Fresh report will be generated on the run. In case of some reports, filtering is impossible due to the stable content of the report. You can always view a printable version of the report or generate a PDF or CSV which can be saved on your disk. In this section we will show you how to prepare a few exemplary reports. 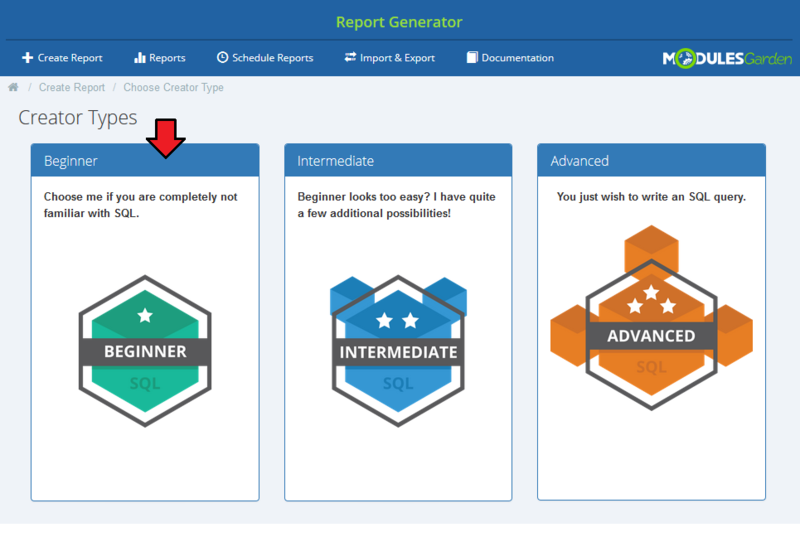 We will now show you how to develop three different reports, each one will slightly more complicated than the previous one. The first steps are the same for each advancement level. Now select the type of chart that you wish to achieve in the final result. You may generate a 'Colum', 'Pie', 'Table' or 'Area' chart. For presentation purposes we will start with a Table chart. Let's begin with the easiest one - 'Beginner'. 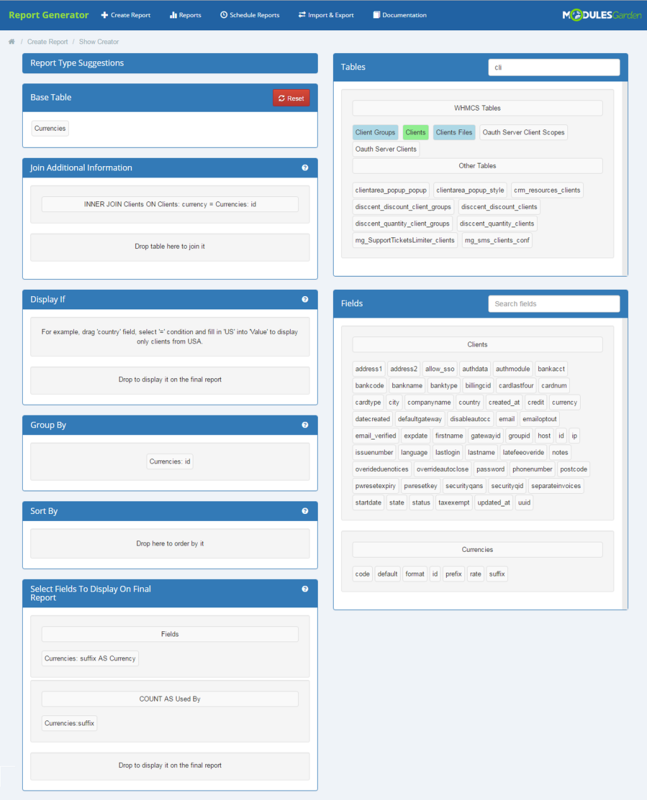 When you enter the creator, the first things you can see is a wide description table with example. When you are familiar with it, press and it will be automatically hidden. Depending on what your report is going to analyze, you must now find appropriate table. 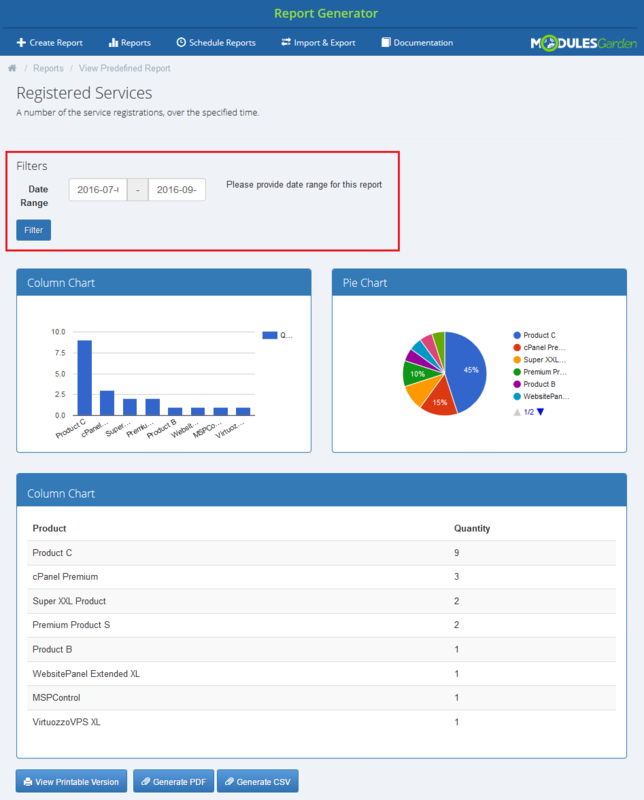 For example if you want to create a report that will base on clients, then find such WHMCS table. 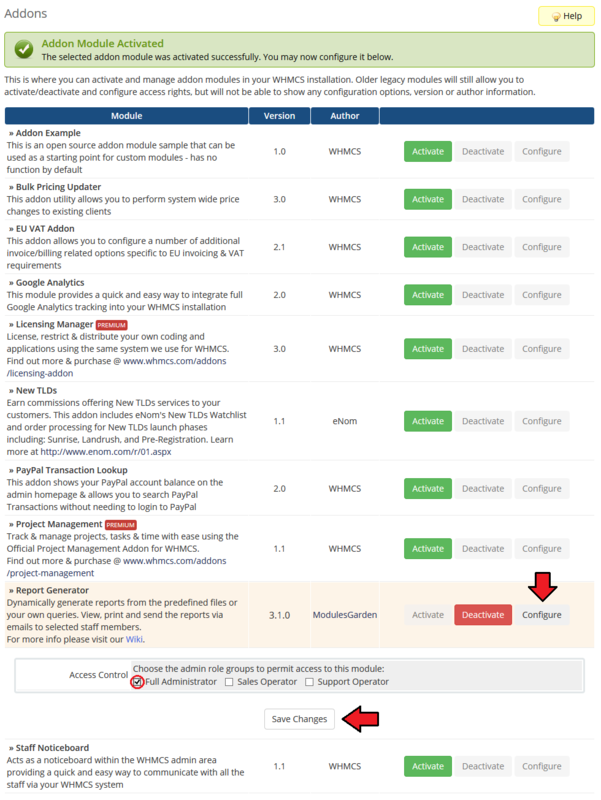 If you want to join it with another table, then drag it and drop into 'Join Additional Information', note that you may join only tables highlighted in blue. Now, let's move to 'Display If' section. From available 'Fields' drag option that you want to select. We have decided to drag 'Status' and provide its value: 'Unpaid'. Then only unpaid invoices will be taken into consideration in the final report. Let's move to 'Select Fields To Display On Final Report' section. Drag from ' Fields' ' section any ones that you wish to see on your report. You can also decide the way the entries will be sorted. 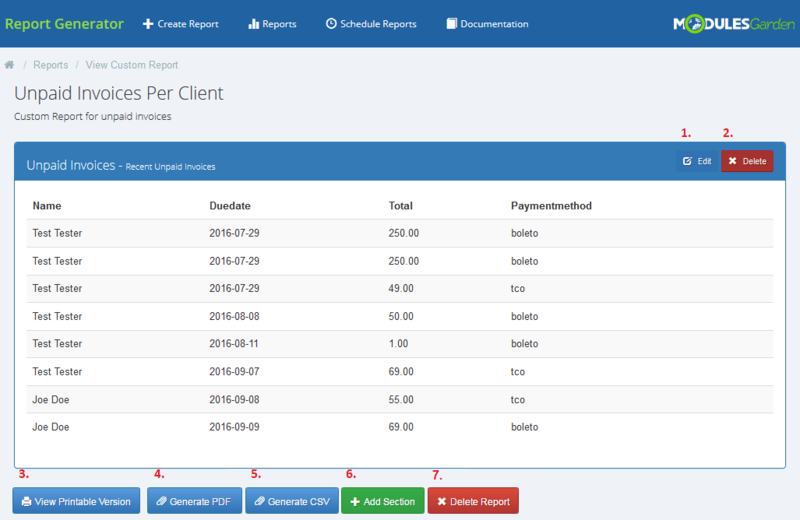 On the screen below you can see sorting by invoice due date in descending order. Let's check how our report will look like. You can see there a list of clients, due date of their unpaid invoices together with the amount to pay and a selected payment method. Take a look at the full creator view. Save the changes when your report is ready. Apart form the options used to generate this report, there are also 'Group By' and ' Limit'. We will show how to use them in other examples. Finally, name your report and describe it shortly. When you open the creator, the overall view is very similar to the 'Beginner' creator type. Here you also select items depending on your needs and drag them into proper fields. The difference here is the possibility to make adjustments to your report with the use of PHP language. Whenever you commit any changes remember to save the section. 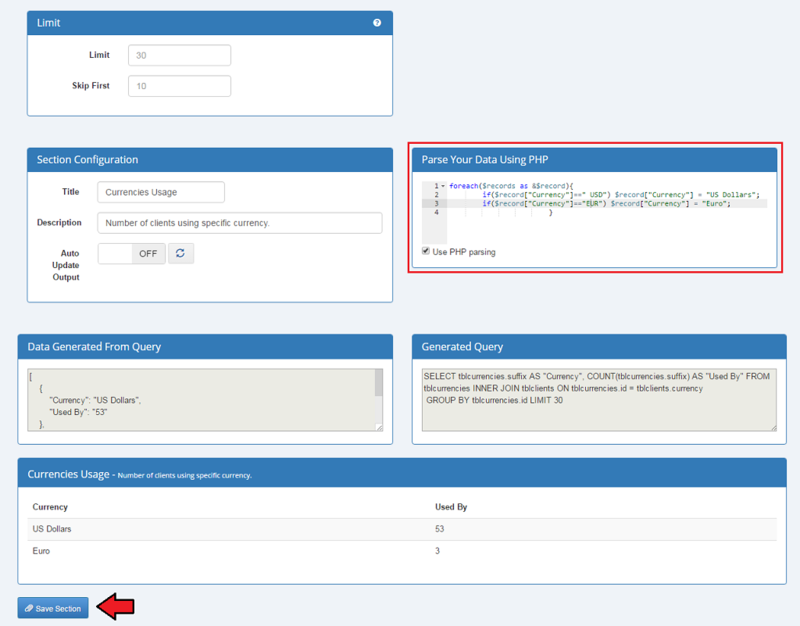 This creator allows to use advanced option, such as writing an SQL query. Just provide correct variables in the box on the left. You can also add a filter that will be used while searching through the report. Give the details corresponding to your needs the most and save changes. 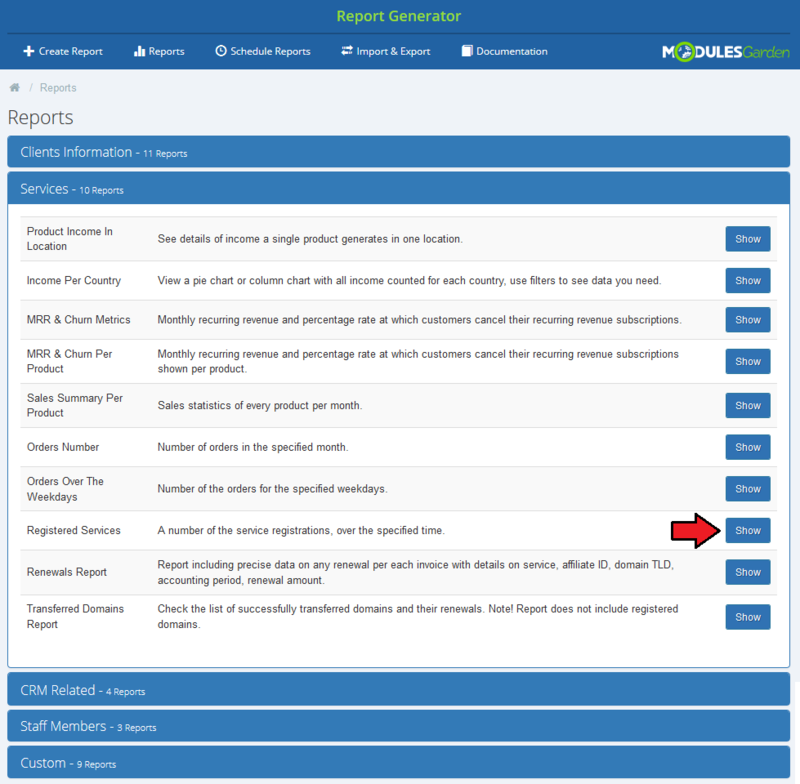 At 'Schedule Reports' section, you can point which reports will be sent directly to administrators. Press 'Schedule Report' to begin. Box with a form to fill in will appear. Start by selecting the report you want to schedule. On the dropdowm menu you will find all reports available in you module including your custom reports. Please note that the form may slightly differ depending on the selected report type. Afterwards, specify the conditions, how often reports should be sent, time period for which the report shall be generated and way of sending, by email or by FTP etc. Additionally, provide staff email addresses or FTP/SFTP details. Confirm through pressing 'Add Rule' button. 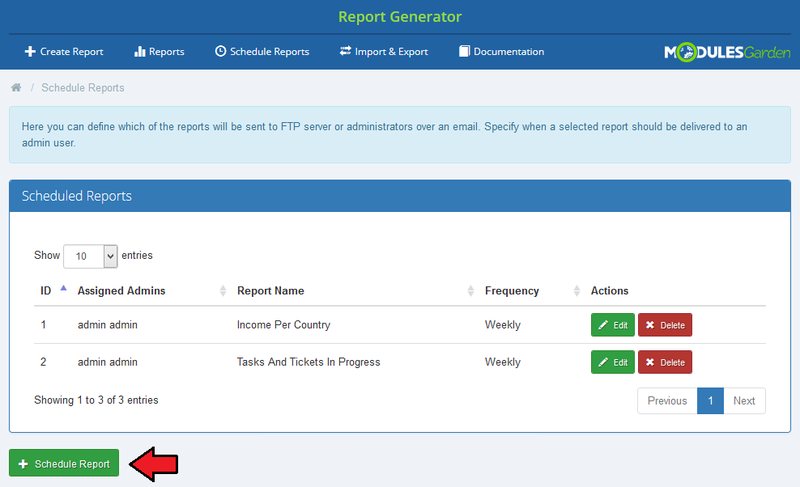 As you can see on the following screen, all scheduled reports are listed in the table with report name, frequency and assigned admin users. Each of planned relations can be removed or edited at any time, use action buttons to do so. At the end you have to add a cron job as shown below (each 24 hours suggested). Do not forget to replace 'your_whmcs' with your WHMCS root location. 'Import/Export' section allows to quickly import your saved previously reports if you have for example stored them on your external disk for later use. Just select file and press 'Import'. 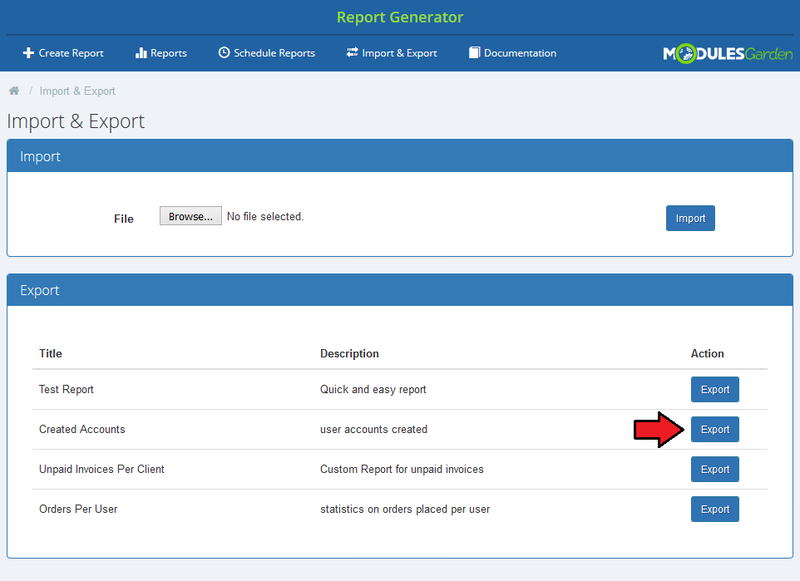 Imported report will appear on the list of your custom reports. Underneath, you can see a list of your custom reports. Press 'Export' button to save its files on your disk. 1. 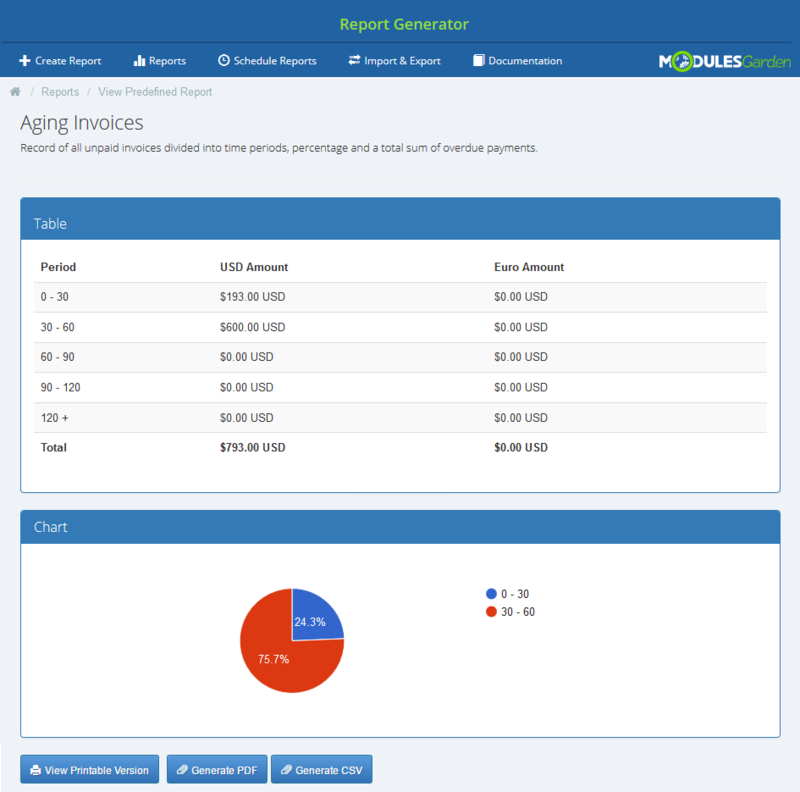 If you want to edit your custom report and make it more complicated, you may do it with a more advanced creator. When you are editing a report you may choose from the beginning which creator type you are going to use. 2. 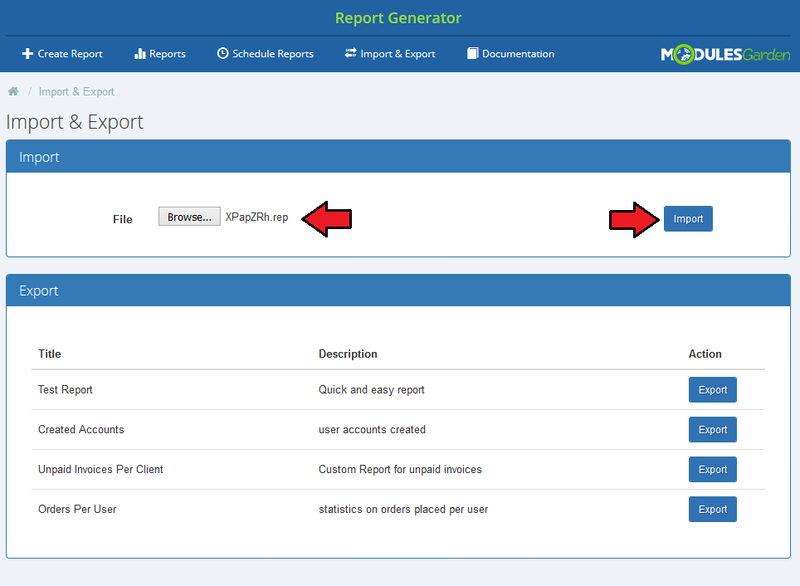 Report Generator For WHMCS requires ZipArchive PHP library installed on your server. This page was last modified on 11 March 2019, at 09:28. This page has been accessed 69,408 times.